Coral Triangle Adventures began 2019 with a bang on a snorkeling trip to one of our most beloved areas – Raja Ampat. Having run trips to this astounding region for over ten years we continue to find new and rare species on untouched reef sites where snorkelers find themselves in nirvana. Our first adventure in 2019 was no exception. We first journeyed south from Sorong and found ourselves among the numerous limestone islands southeast of Misool. Amazing coral reefs thrive in this part of southern Raja Ampat. Reef-building corals mix with shallow soft corals creating colorful, living gardens of marine life. A multitude of small reef fish and invertebrates thrive in this aesthetic setting. After a couple of days exploring this area we worked our way northwards towards Batanta where we were treated to a fantastic swim with at least five resident manta rays. Observing these incredibly majestic creatures, with wingspans up to 10 feet wide, is always a treat and we had virtually unlimited time with them as they kept returning again and again to a shallow cleaning station. This same day our group took a short break from the water to investigate a beautiful waterfall well hidden in a mist-covered rainforest nearby. The short walk to this gem of a waterfall showed us the lushness of this area’s jungles. From Bantanta, our ship, the Gaia Love, continued north and we spent a few days along the western edge of Raja Ampat’s largest island, Waigeo. This area provided us with unique snorkel sites where vibrant tunicates, sponges, and soft corals merge and form living walls of color. Among this amazing menagerie we spotted nudibranchs galore and many fish including Pewter angelfish, Splendid dottybacks, and ornate ghost pipefish. Other highlights found in this bio-rich area included an estuarian seahorse, a Tasseled wobbegong, a juvenile broadclub cuttlefish, and even an uber-rare Flamboyant cuttlefish! Moving southward again, back towards the Dampier Strait and accompanied by stellar weather, we encountered stunning reefs fringing mangrove-laden islands north of the island of Gam. Velutinid snails, Signal gobies, spawning Blue-green damselfish, yellowbarred jawfish, Banded sea kraits, and many, many other species were spotted on these reefs. The next couple of days included reef flats and slopes where we were able to view a number of well-camouflaged crocodilefish, juvenile Many-spotted sweetlips, a rare swimming Brown-banded bamboo shark, and even a pair of dugong swam by our group in the distance. Finishing off our snorkeling in the renowned Dampier Strait, we encountered large schools of bumphead parrotfish, hawksbill and green turtles, blacktip sharks cruising in the shallows, broadclub cuttlefish, and to top if off an all-black manta ray cruised beneath us capping off a truly wonderful journey. 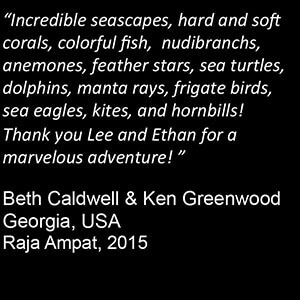 Our next tour to Raja Ampat is Feb 2020, please email us to find out how you can join!